Yes, it’s true that turbocharging is currently pervading its way across the engine lineup of most American trucks. Regardless of cylinder count, your author is reluctant to admit that forced induction is The Way Forward, given the simultaneous customer demand for both more power and more efficiency. Trouble is, though, most of those mills sound like a soulless demon huffing atmosphere. Even the mighty Raptor simply sounds like Marilyn Manson screaming obscenities into a Dyson vacuum cleaner. This helps explain why, more than ever, the burbly exhaust note of a hairy-chested V8 engine holds a great deal of appeal to true gearheads. It’s a sound that cleanses the palette and resets the aural taste buds. Let’s call it ear conditioning. 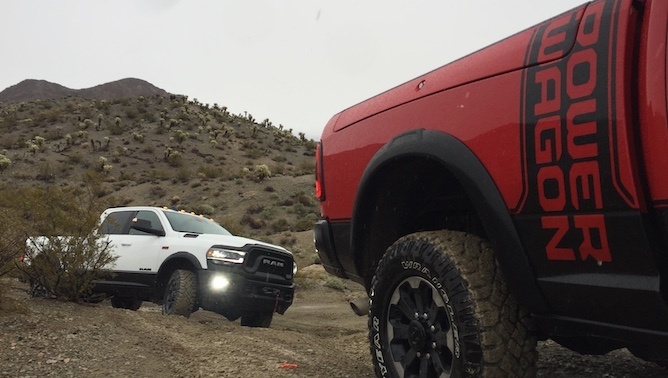 The new 2019 Ram Power Wagon has it in spades. 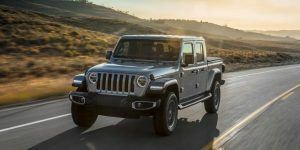 Powered by the brand’s familiar 6.4L Hemi pushrod V8 making 410 horsepower and 429 lb-ft of torque, it is now shoved along the trail by Ram’s excellent eight-speed automatic transmission. Planting one’s right foot squarely on the accelerator pedal unleashes an old-fashioned exhaust roar that works like a combination of raw steak, mixed martial arts fighting, and a demolition derby. It is one of the most testosterone-laden noises on the face of this green earth. I made have made a stop sign pregnant while driving past it. Stay tuned to Maury to see if I’m the father. 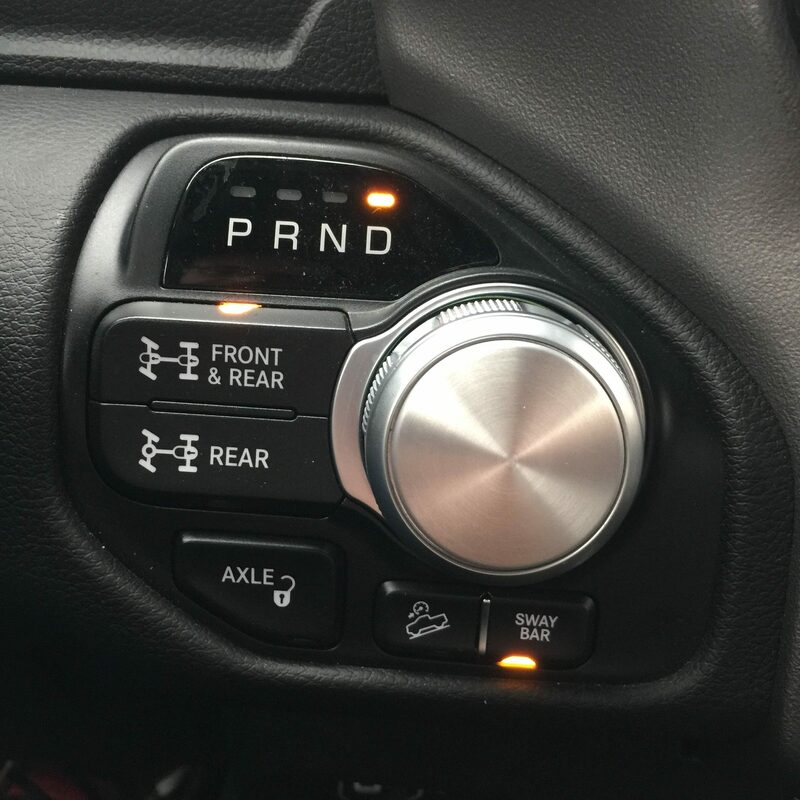 Luddites of the world will recoil in horror of the addition of “that knob thing” deployed as a gear selector but the truth of the matter is this: binning the mechanical linkage frees up space and reduces the number of hard parts that can seize up and fail over time. Don’t worry – there’s still a fantastic baseball bat of a 4×4 selector sticking out of the floor like an overgrown larch. Exterior styling has been worked over for 2019, incorporating familiar design elements while injecting some new toys. If you’re thinking that grille is bigger, then give yourself a gold star. As the item that arguably provides the most visual impact on this beast, it stands a good 1.5 inches taller than the old truck, allowing for extra cooling when needed. 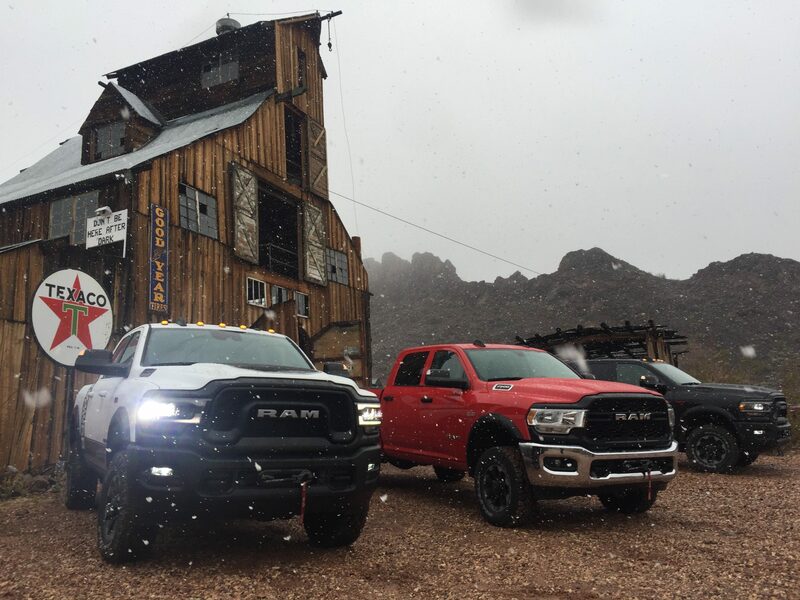 Those clearance lamps on the cab are a lower profile and now house LEDs, while the new headlight show off Power Wagon’s take on the new Ram lighting signature. The old whip antenna vanishes and is replaced with a shark-fin on the roof. 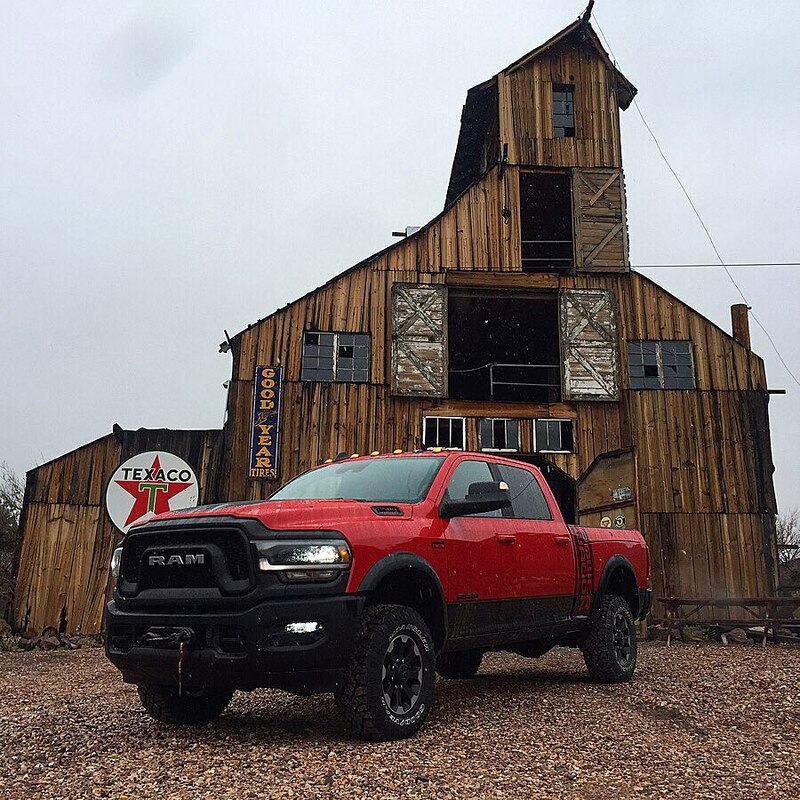 Anyone reading this site knows that Ram includes the proverbial off-road kitchen sink in the Power Wagon: factory suspension lift, locking front and rear diffs (4.10s remain standard in the rear), disconnecting sway bar, and a 12,000-lb winch are but a few of the toys meant for getting into (and out of) trouble on the trail. New for this year is a unique fairlead on that winch, paired with a new synthetic line that Ram promises will not kink or fray. Practically, a synthetic line is more maneuverable than the old steel-braided one as well. The switch also drops 28 lbs of weight. 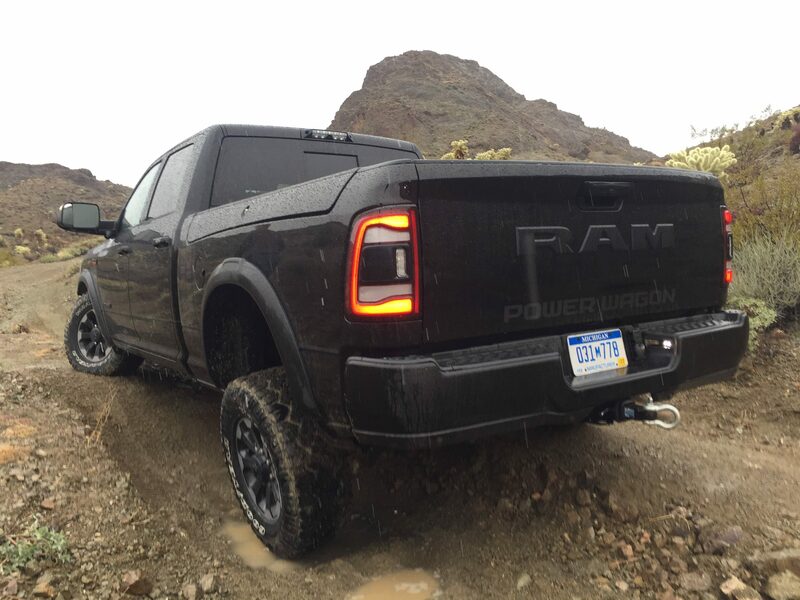 When you do punch that sway bar disconnect button – and you had better punch it, as this is not a truck in which you ‘press’ or ‘touch’ buttons – solenoids whir and click to disconnect the sway bar, making the most out of the truck’s 14.2 inches of ground clearance. Approach angles stretch every bit of 29.4 degrees, far beyond the standard pickup. 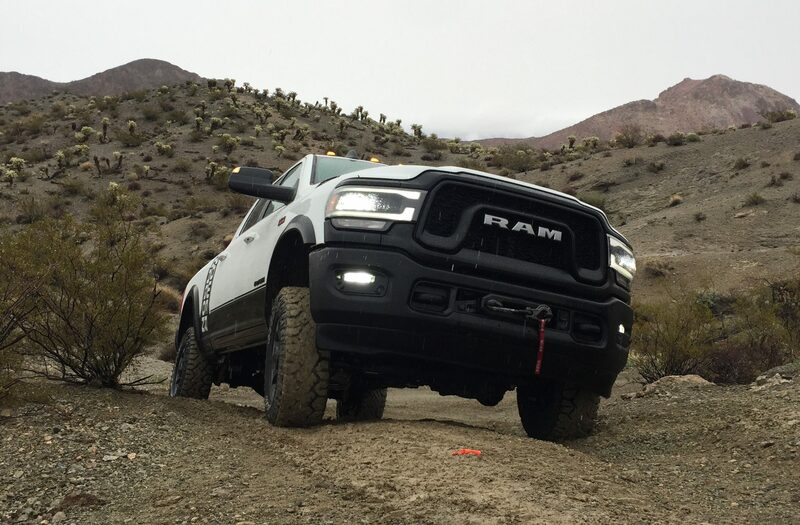 Ram’s unique front suspension design incorporates high movement joints with the disconnecting sway bar, allowing for gonzo flexibility and axle articulation. Ramp travel index is newly improved, too. ALSO SEE: GM 3.0L Duramax Diesel: Power Numbers & Trim Details! In fact, that new eight-speed transmission allows for a 51:1 crawl ratio, thanks to gearing and programming choices during development. Add in improved shift refinement compared to the old Power Wagon, and the inclusion of the new eight-speed is a win-win across the board. 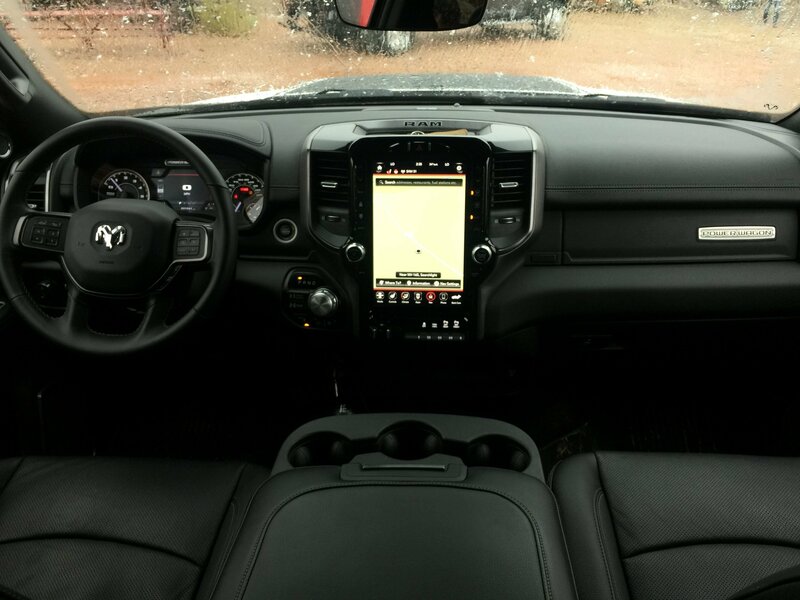 Rod Romain, chief engineer for Ram Heavy Duty, has a golden radio voice that actually sounds like a truck. It’s yet more ear conditioning from Ram. 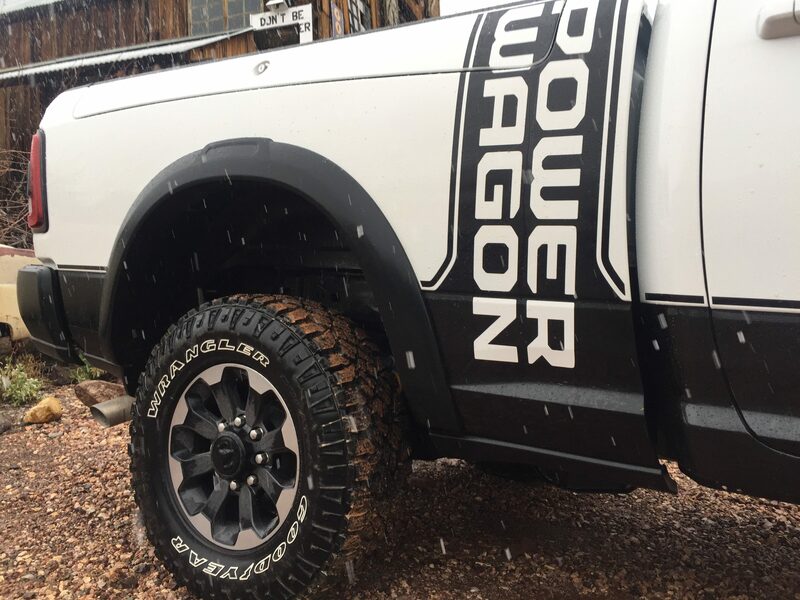 Seriously – if a Power Wagon could speak, it would do so in Rod’s dulcet and gravelly tones. Anyway, Rod explained how the group listened to existing Power Wagon customers and infused much of their feedback into the new truck. 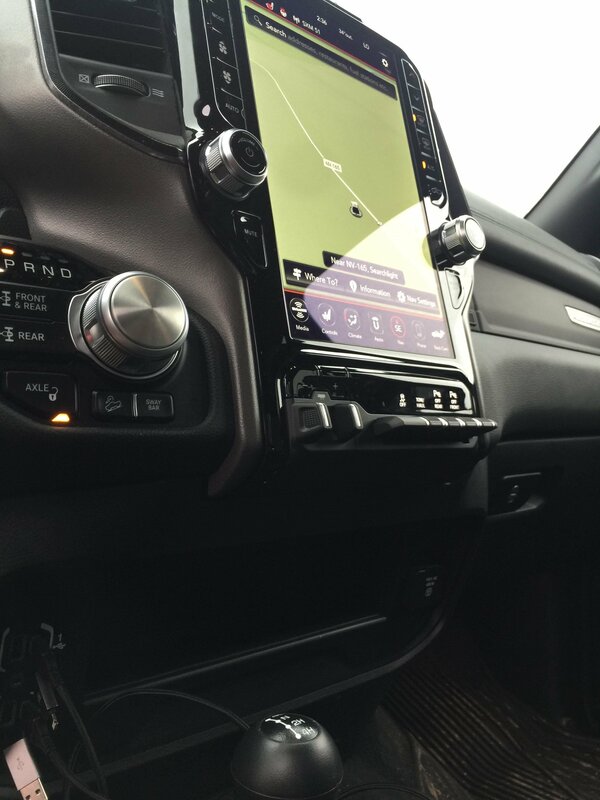 A new 360-degree camera option, something your author pined for in the old Power Wagon, gives a bird’s-eye-view with forward view gridlines to help drivers easily navigate obstacles on the trail. The downhill descent control max speed can be adjusted via buttons on the wheel and works as advertised. 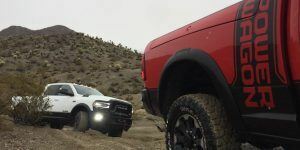 Hammering over a fast sand wash in the Nevada desert, your author learned that the 2019 Ram Power Wagon can approach highway speeds while in 4Lo, handy for keeping up with the pack between obstacles without having to spend time shifting through the transfer case. Trying that same trick in a light-duty Rebel results in warning claxons and threatening dashboard illuminations. Ask me how I know. For 2019, the Power Wagon’s interior largely mimics that of its snazzy little brother, which falls squarely into the category of a Very Good Thing. Acres of legroom encourage riders to buy cowboy boots and splay their feet, as does the stretch-em-out front bench seat and vast array of storage places. The absolutely mahoosive 12-inch infotainment touchscreen is available in a number of trims including, I am happy to report, the Power Wagon. Combined with a bench seat and 4×4 lever sticking out of the floor, it creates a too-cool blend of modern and traditional cues. Go ahead and spec the big screen; you won’t be disappointed. Introverts will be glad to know that the Power Wagon kit remains an option of Tradesman-trimmed Ram HDs. 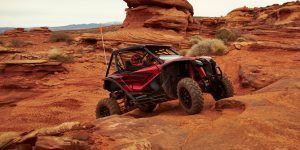 This allows customers who want the off-road equipment and capability of a Power Wagon but do not care for its over-the-top aggro styling cues to play in the dirt as well. The LT285/70 Goodyear Duratracs, that winch, Bilstein-branded shocks – it’s all present and accounted for. Pricing for a 2019 Ram 2500 Crew Cab Power Wagon doesn’t move the needle much from last year, checking in at $52,900 before destination fees. Given the increase in interior comfort, off-road improvements, and jazzier exterior styling, I’d say that’s a pretty reasonable deal. With the exhaust note of that naturally aspirated Hemi, you might even say it’s music to the ear.